Was owned by the Metropolitan Museum of Art in NY, but was claimed by the Greek govt., and the MMA relented in about 2007 to return it, based on the claim that there hadn't been a valid permit for its export. The MMA lost millions of dollars in the process. 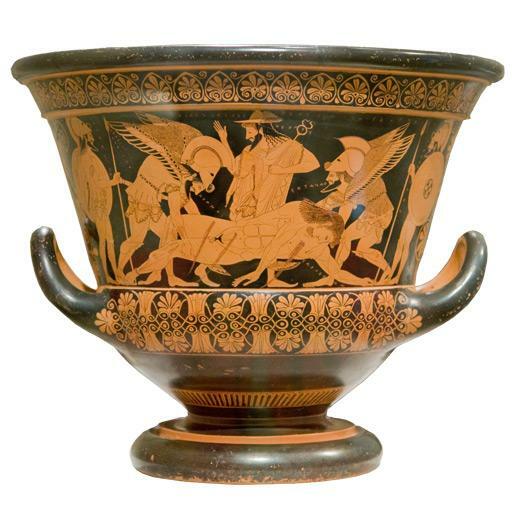 Very large, perfectly intact karater depicting highly detailed mythological Greek scenes of death on battlefield. It is a monument in the "red figure style" of Greek Vase painting. There can be arguments for this work going into the Experiential Art category, as a form of painting/illustration, and an argument for it going into the Product-design category, since it is nominally a vase, a holder for something (wine or oil). But this latter choice would be quite lame, since it was presumably never intended to be a functional vase.